having won four straight games. LJWorld. Few times in my years of watching Sunflower League football have I seen an offense click and operate as efficiently as what I saw from LHS on Friday. The team has won four straight games and looks as good as anyone in the league. It took nine games but Olathe North finally shed the awful losing streak that had accompanied the program since last October. It may be time for the Eagles to start a winning streak. They face the other three Olathe schools in three of their next four games to close out the season. The Lancers successfully completed the Olathe sweep, going 4-0 against Olathe School District opponents (in successive weeks, no less). 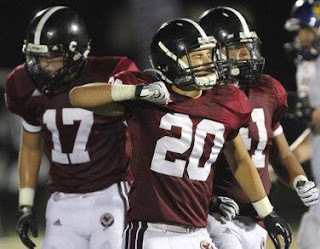 The last team to do that was Free State in 2006, a team that went 11-1 and is widely recognized as the league's most explosive offensive team of the last decade. Great company to join, Lancers. The Falcons' offense is based around the run--we get that. But the loss of their top receiver from last year, Drew Johnson, has really taken its toll on the team's passing efforts. On top of that the defense has been wildly inconsistent in two of the team's three biggest games this season. The Indians not only fell to 0-5, but they also lost one of their top players when running back Jesse Patterson left the game with a concussion in the first half. Nothing has gone SM North's way this season. Three of the Hawks top players, Hayden Frazier, Al Smith and Ryan Woodson were reportedly not suited up against SM East. Olathe East has struggled with those guys in the lineup, and without them they looked even more pedestrian. Tye Hughes, Lawrence Free State: Last Saturday I wrote that Hughes was one of the four most versatile playmakers in the league and he lived up to that billing against SM North. He caught five passes for 137 yards and two touchdowns and also returned a punt 74 yards for a touchdown. Brett Sterbach, SM West: Sterbach had an incredible night on Thursday, carrying the ball 38 times for 266 yards and three touchdowns. His scores came on runs of 79, six and 19 yards. Brad Strauss, Lawrence: In leading his team to a victory over Olathe South, Strauss passed for 215 yards and two touchdowns and rushed for 64 yards and three touchdowns. 1. SM East (5-0): It's practically a guarantee that SM East will finish with at least seven wins in the regular season. The two questions marks left--games against Free State this Friday and SM West in week eight--will really help to confirm or deny the Lancers' state title credentials. 2. Lawrence (4-1): The Chesty Lions jump three spots after their stellar home performance against Olathe South. They'll be favored in their next three games leading up to what could be the best matchup of the season when they play Free State in week nine. 3. Olathe South (3-2): The Falcons have lost two straight but don't lose site of the hellish three-game stretch they just completed--road games against Free State, SM East and LHS. They really shouldn't lose a regular season game from here on out. 4. Lawrence Free State (4-1): The Firebirds could really make a statement to the league if they can pull out a victory at home this Friday against SM East. Add the game to the seemingly endless list of fantastic Sunflower League battles we've had this season. 5. SM West (4-1): The Vikings have dropped two spots in two weeks despite two wins, but it's not indicative of their play over the time period--it's more a product of the other top teams playing one another. The Vikes have won playing their own style of football and they should win no less than seven regular season games. Stay tuned for their week eight showdown with SM East. 6. SM South (3-2): From what I've seen SM South is a middle-of-the-league type of team. But I see that as a huge compliment for a program that has won just four games the last two years. The Raiders have a tough stretch to end the season but they have the big play ability to beat just about anyone. 7. Olathe East (1-4): What the heck is going on at Olathe East? The Hawks better get their act together, and soon, because a hungry Olathe North rival awaits this Friday and districts are just around the corner. 8. Olathe North (1-4): Gene Wier and his Olathe North Eagles came out and dominated Leavenworth in all facets of the game on Friday. A chill ran up the spines of the fans of other league teams who remember watching Olathe North's glory days. 9. Leavenworth (3-2): As had been pointed out in the comments section, Leavenworth is this year's version of Jekyl and Hyde. Their best player, Jason Randall, will look like a Simone candidate one week then fall off the map the next. The Pioneers have a rough upcoming three game stretch against SM West, Lawrence and Free State and they must be more consistent. 10. Olathe Northwest (1-4): Maybe the Ravens should just agree to play all their games on the road from here on out. Their offense played like one of the league's best Friday night, putting up 49 points and having their way with SM Northwest. 11. SM Northwest (1-4): Does anyone think SM Northwest could beat Olathe North in a rematch of the Cougars' week one victory? The team has really struggled the last four weeks and three of their next games against Olathe South, SM East and SM West look potentially painful. 12. 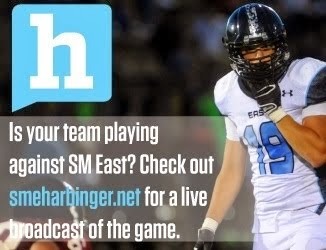 SM North (0-5): Thursday night's 41-point loss to Free State was bad. Let's make a deal Indians--you win one of your remaining four games and we'll forget how rough the season has been for you to this point in time. Seriously. Follow me @eliunderwood. I will follow you back. Teams that have the most interaction during the week (follows, Retweets, Tweets @eliunderwood, Favorites, comments, etc.) earn the most cred on the social media standings. I also factor in how solid each team's student section is at the games. The most interactive Tweeters from each school get their username's listed below their school. I would strongly encourage you to follow these users because of their high volume of interactivity. If you build it (a program) they (the fans) will come. SM East was near full-capacity at SM South District Stadium last Friday for their homecoming game with Olathe East, an impressive feat regardless of the game. For that they get a bump up in the rankings. What will be most telling is how they travel to Lawrence this weekend to see their beloved Lancers take on Free State. I was at the Olathe South vs. Free State game in Lawrence three weeks ago, and I remember how well the Olathe South students traveled. Let's see if the Lancers can match it. Lawrence High Stadium was rocking on Friday night. Granted, it was the biggest game of the week, but their student section's dominating presence made an impact all throughout the game. Their team is winning and looking good--let's see if their fanbase can pick it up with more follows and interactivity on Twitter. It may be a little early for this, but it looks like whoever makes it to state this year is going to have their hands full with Derby. They have been stomping everyone, including Salina South, who just got done putting a solid victory up against Hutch. OS will finish the year strong, probably win out, but I am not convinced they are #3 in the league. Two of their 3 wins are against the bottom of the league and the third was against FS that offered them early Christmas with 4 turnovers and still had a chance to win at the end. Taking nothing from the win, they won fair and square - a win is a win. They are good, for sure, but I believe SME, LAW, FS and SMW have built the most momentum going into the last week before districts. SME vs. FS this week will be very interesting... great offense (FS) vs. great defense (SME). If FS can win and LAW can contain Guild and SMS, the 10/26 match-up with those two should determine district and league champs. A lot of football left to be played, but the separation has begun for the contenders and the pretenders. LFS has very little chance to win the conference. You have to rememmber that the other three teams you mentioned (SME, SMW and LAW) do not have any official "conference" losses and LFS already has a "conference" loss. They other three teams control their own destiny at least for a share of the conference championship but LFS needs help. Additionally, there are only 3 games left that have any meaning towards league championship, SME-LFS, SME-SMW and LFS-LAW. FS would need to beat SME and LAW and have SME beat SMW to wind up in a four way tie. LFS and SME of course each have two tough games left, SMW and LAW have only one. If SMW beats SME and LAW beats LFS, Vikes and Lions tie for championship. Not sure if they would use the head to head to break that tie, since their game was tachnically 'non-conference'. Interesting question for anyone familiar with league rules, would SMW be crowned champ on basis of head to head win or would it be declared a tie? Also if SME and LAW win out, they would tie and did not play. But the best the 'Birds can possibly get is a four way tie barring one of the big 4 losing to one of the little 7. OS is certainly part of the 'big 5' but has no chance of winnnig or sharing the conference championship now without some major upsets.